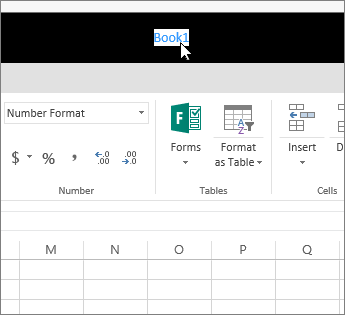 Here's a quick walk-through of Excel Online. You'll find it's pretty straightforward and similar to what you're used to. Type a name that works for you. Keep in mind that anything you do in Excel Online — from naming the file, to working in the cells — is saved automatically, just like in Sheets. After you've named your file, you can do what you usually do: enter data, add formatting, type formulas, make charts, and so on. All features are available to you on the tabs at the top. If you find the tabs are taking up too much space, double-click a tab and the ribbon collapses to give you more room. The Excel app will launch and open the file. When your changes are saved in the application, they get saved to OneDrive. There's no need to do a "Save As" and re-upload the file.